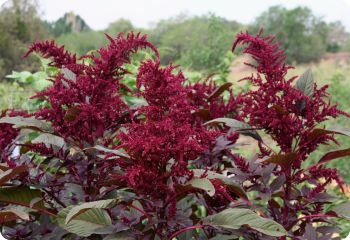 Hopi Red Dye amaranth is a beautiful annual with dark, purplish-red leaves and burgundy-red flowers. It looks terrific at the back of the border. Pictures can't do justice to this wonderful plant. Amaranth 'Hopi Red Dye' is a famous heirloom. It has shiny black seeds that can be cooked for cereal or ground into a gluten-free flour. The tender, young leaves of this variety are my favorite for adding to soups.